The baseball game scheduled for April 24th has been postponed to May 7, 2019. The baseball and softball games scheduled for today, April 16, 2019, have been postponed. The baseball game has been rescheduled for April 24, 2109, 4:30pm start. The softball game has been rescheduled for May 16, 2019. This game will be played at Galeton as a double header with the first game starting at 4:30pm. The baseball and softball games scheduled for today Monday, April 15, 2019 have been postponed. The baseball game will be played on May 3, 2019. Softball game will be played on May 10th. Oswayo Valley Senior, Sara McKean, is shown signing her National Letter of Intent to compete in Indoor and Outdoor Track for Shippensburg University. Sara was awarded the James Manners award as the outstanding AA female competitor at the District Championships and placed fourth at the PA State Championships as a junior. Sara plans to major in Finance in college. Pictured from left to right. Back row: Alec Peinkofer, Director of Activities, Clark Cummings, Head Track and Field Coach, Jennifer Hoffman, Assistant Track and Field Coach, William Howard, Former Director of Activities, Craig Moshier, Assistant Track and Field Coach, and Julie Hall, MS/HS Principal. ​Front Row: Eric McKean, Sara’s father, Sara McKean, and Tricia McKean, Sara’s mother. The softball game scheduled for today Tuesday, April 9, 2019 has been postponed. The softball team will play a double header at Northern Potter on April 29, 2019. The baseball game that was scheduled for Saturday April 6, 2019 was postponed. This game will now be played at OV tomorrow April 9, 2019 at 4:30pm. The softball game scheduled for Saturday April 6, 2019 has been postponed. This game will be played on May 4th, 11:30am start time. The baseball and softball games scheduled for April 2nd have been postponed. The baseball game has been rescheduled for May 9th with a 4:30pm start. The softball game has been rescheduled for April 6th with an 11am start. The baseball and softball games scheduled for today April 1st, OV @ Port Allegany, have been postponed. These games have been rescheduled for April 27, 2019 with an 11am start time. The softball game scheduled for April 18th, Cameron County at OV, has been postponed. This game has been rescheduled for April 24th. The baseball and softball games scheduled for tomorrow (3/26/19) have been postponed. These games will not be played on Wednesday (3/27/19). ​Congratulations Colton! We are proud of you! During the 2019 District IX Wrestling Championships, Oswayo Valley’s own Colton Gietler took 3rd in the district for the weight class of 145lbs. With this impressive finish, he qualified for the 2019 Regional Wrestling Championships held at the Giant Center in Sharon, PA on March 1st-2nd. Colton will be competing on Friday and Saturday for a spot in the PIAA State Wrestling Championships held in Hershey, PA. From the students and staff here at Oswayo Valley, we extend our congratulations for your success thus far, and best of luck this weekend! The boys basketball game and senior night, for both boys basketball & cheer, scheduled for Tuesday, February 12, 2019 has been postponed. This game and senior night has been rescheduled for Friday, February 15, 2019. Spring sports sign-ups are now taking place. You can click on the link below to sign up. Please contact Ms. Amy with any questions. The boys JV/V Basketball game scheduled for January 31, 2019 , OV @ Northern Potter, has been postponed. These games have been rescheduled for February 14, 2019. The boys JV/V basketball game scheduled for Wednesday, January 30, 2019 at Austin has been postponed. The JV game will not be rescheduled. The Varsity game has been rescheduled for Wednesday, February 13, 2019. The Varsity game will start at approximately 7:30pm. Note, Austin has a girls Varisty game scheduled at 6pm. Varsity boys will play after that game. The boys JV/V basketball game scheduled for tonight, Monday, January 21, 2019, has been postponed. Rescheduled date to be announced. ​This game has been rescheduled for February 4, 2019. The boys JV/V basketball game scheduled for Friday, January 25, 2019, Galeton @ OV, has been postponed. This game has been rescheduled for Saturday, February 2, 2019. The JV game will start at noon. Varsity to follow. Due to impending weather all weekend activities are either cancelled or postponed. The boys JV/V basketball game scheduled for tonight, Monday January 7th has been postponed. This game will now take place on Friday, January 18th, 2019. 11/21/18 - All After School Activities Are Cancelled for Today! Winter sports and trap team sign-ups for the 2018 – 2019 school year are now taking place for students in grades 7 – 12. Please visit www.oswayovalleyathletics.com to sign up or you may click on this link 2018-2019 Winter Sports Sign-Ups. Last day to sign up is Friday, October 12, 2018. Reminder all student athletes are required to have a sports physical. If you have not had a sports physical, please do so as soon as possible. Packets are available in the office or contact Ms. Amy. Please note all physical packets must be returned to Ms. Amy prior to the start of practice. Winter sports start November 16th. Please contact Ms. Amy with any questions or concerns, 814-260-1701 ext. 225. The cross country meet scheduled for today, Tuesday October 2, 2018 has been postponed. This meet has been re-scheduled for Tuesday, October 9, 2018. 9/26/18 Golf Match CancelledThe golf match scheduled for tonight, Wednesday, September 26, 2018 has been cancelled. There will be no practice. The golf match scheduled for tonight Monday, September 17, 2018 has been postponed. The golf match will now take place on Thursday, September 20, 2018 at 4pm. The Golf match scheduled for today, Tuesday August 21, 2018, Coudersport @ OV, has been postponed. Re-scheduled for Tuesday, September 11, 2018. Good luck to the OV Baseball Team as they head back to Shower's Field in DuBois for the Quarterfinals of the PIAA Baseball Championship. The Green Wave will play Vincentian Academy today, Thursday, June 7, 2018. The game starts at 4pm. Good Luck OV! Any students in grades 7th thru 12th that are participating in a sport during the 2018-2019 school year must have a physical dated on or after June 1, 2018. The Oswayo Valley School District has contracted with the Shinglehouse Health Center to provide students the opportunity to obtain a physical at a cost of $16.50 per student. The established dates for these physicals are Wednesday, July 18th and Thursday, August 2nd from 8:30 am - Noon. A parent/guardian must be present at the time of the physical. Please be informed that fall sports start on Monday, August 13, 2018. Parents should contact Mrs. Amy Unverdorben before July 13th to schedule a physical at 814-260-1701 ext. 225. All checks should be made payable to the Oswayo Valley School District and given to Mrs. Unverdorben before your scheduled appointment. Congratulations to the OV baseball team on their win over Berlin-Brothersvalley Monday night in DuBois. This was the first round of the PIAA Baseball Championship. Congratulations to OV's Sara McKean. Sara placed 4th in the long jump at the PIAA State Championships! Congrats Sara! We are proud of you! Congratulations to the OV Baseball Team on their win over visiting North Clarion, 10-0, 5 innings. 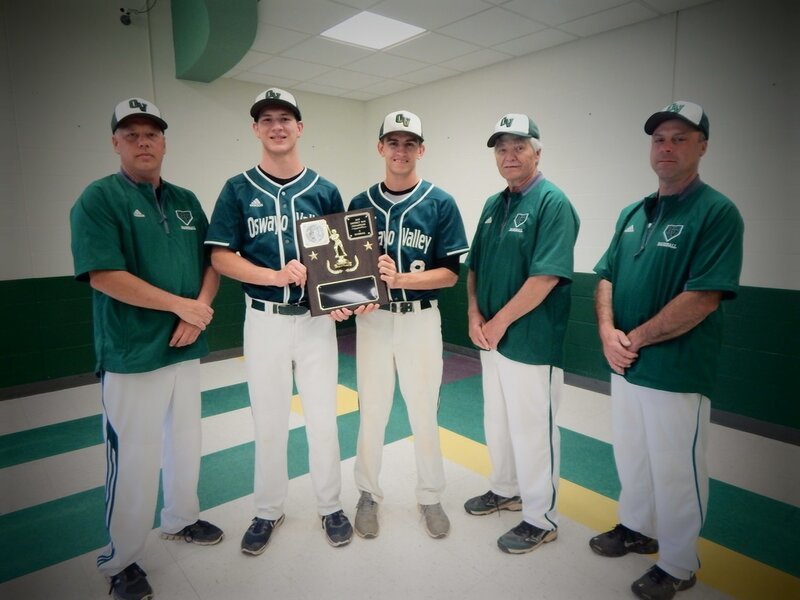 The Green Waves will travel to Shower's Field in DuBois on Tuesday, May 29, 2018, where they will play DCC in the championship game. The game starts at 6:30pm. 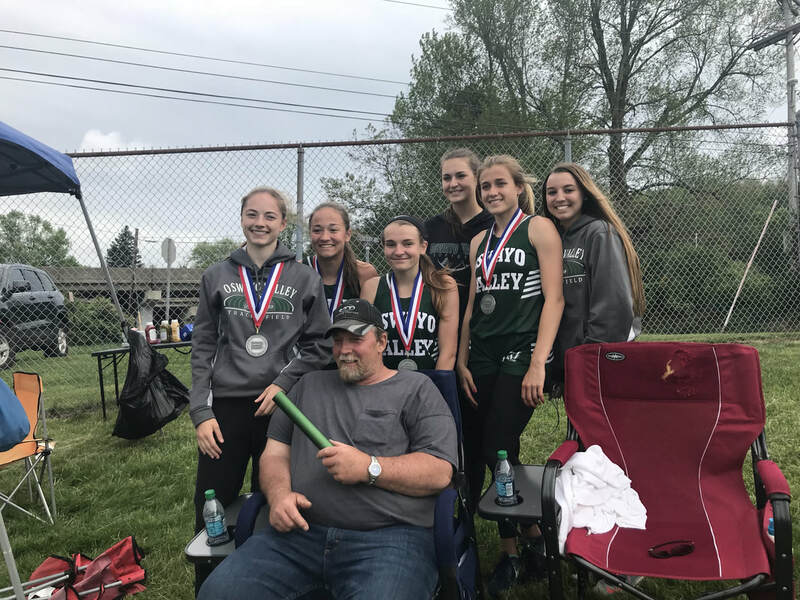 The Oswayo Valley girls track team had an outstanding evening at the District 9 Track and Field Championships at Brookville last Friday. Sara McKean was chosen as the recipient of the James Manners award as the outstanding AA female competitor. Sara won the long and triple jumps and the 200 meter dash and was on the 4 x 100 relay team that placed second and qualified for states. She was on the relay team with Shayla Bickel, Faith Coole and McKenzie Gross. Those four plus Madison Miller will be travelling to Shippensburg this Thursday, Friday and Saturday. In addition to previously mentioned events Faith Coole placed second in the 100 meter dash. The baseball game scheduled for tonight, OV @ Friendship, has been cancelled. This game will not be re-scheduled. Sports sign-ups for the 2018-2019 school year are now taking place. last day to sign-up is Friday, May 4, 2018. See Ms. Amy with any questions. The softball and baseball games scheduled for tonight will be played at Oswayo Valley. We will play at Smethport on May 16, 2018. The softball game scheduled for Saturday, April 21, 2018, Port Allegany at OV, has been postponed. This game will now be played on Saturday, May 19, 2018. This game will start at noon. Sara McKean has had an outstanding spring track and field season. 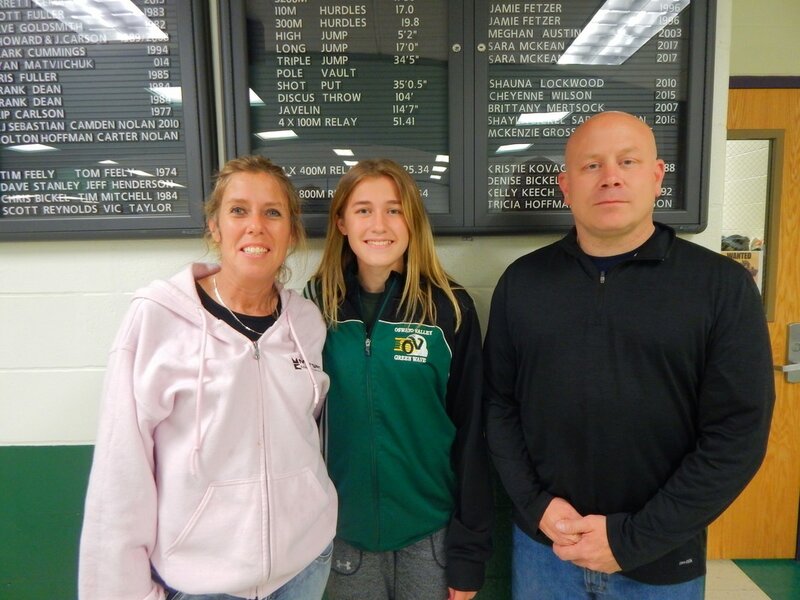 Recently Sara competed at the Brookville Invitational Track Meet where she won both the Long Jump and Triple Jump. She also placed second in the 100 meter and 200 meter sprints. Sara’s winning jump in the long jump at Brookville would have been good enough for sixth place at last year’s state championships at Shippensburg. We’re wishing Sara the best for the remainder of this track and field season. Senior Dylan Pesock has culminated his high school wrestling career with numerous accomplishments. 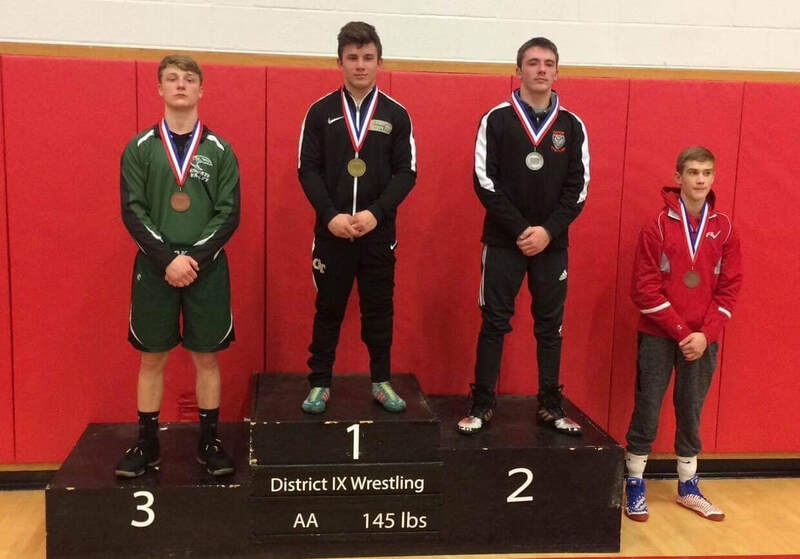 Dylan placed third in the 113 pound weight class at the District 9 Championships in Clearfield, PA which qualified him to move on to the Northwest Regional Championships in Sharon, PA. His third place finish in that weight class at Regionals qualified him for the P.I.A.A. State Championships in Hershey. After winning his first bout Dylan was eliminated from further competition. Dylan was named to the Allegheny Mountain Wrestling League All-Star team at 113 pounds. In addition he was named to the Big 30 Wrestling All-Star team at the same weight class. This is a distinct honor for Dylan. For his efforts throughout high school Dylan was offered, and he has accepted, a Grant-In-Aide scholarship to wrestle at Mercyhurst North East College. We appreciate all Dylan’s efforts to reach these high levels of accomplishments and wish him the best in his future endeavors. Senior Shayla Bickel has enjoyed an outstanding year in athletics. She was an all-star in both Volleyball and Basketball. She finished 8th in District 9 in basketball scoring with a 19.0 points per game average. Shayla was selected to play in the Big 30 and the District 9 Sportsmanship basketball all-star games. She is a member of the Oswayo Valley Softball team where she was selected as an all-star during her junior year. She is also a member of the track and field team where she runs sprints and is a member of the highly successful relay teams. Senior Theo Henry culminated his high school basketball career with numerous outstanding accomplishments. Theo finished 7th in District 9 in overall scoring with a 19 point per game average. He was selected to the NTL All-Star basketball team. In addition to those accolades Theo was selected to play in the Big 30, New York versus Pennsylvania All-Star game and the District 9 Sportsmanship Game. We want to congratulate Theo on his efforts and accomplishments and wish him the best in his future endeavors. The Jr. High track & field meet, OV at O-E, scheduled for tonight has been postponed. The meet has been re-scheduled for Wednesday, May 9, 2018. The Jr. High track & field meet scheduled for May 9, OV at Northern Potter, has been postponed to May 8th. The varsity track & field meet scheduled for tonight has been postponed. This meet will take place on April 25, 2018. The track & field meet scheduled for tonight at Otto-Eldred has been postponed. This track & field meet has been re-scheduled for tomorrow Wednesday, April 18, 2108. The baseball and softball games scheduled for today, Tuesday, April 17, 2018, have been cancelled. These games will not be re-scheduled. The softball game, Port Allegany @ OV, scheduled on May 5, 2018 has been re-scheduled. This game will now be played on Saturday, April 21, 2018. The game will start at noon. A softball game has been added to the scheduled for Friday, April 27, 2018. Cowanesque Valley @ OV, 4:30pm start. Congratulations toTony Clark on his induction into the District 9 Wrestling Hall of Fame this year at the District 9 Wrestling Championships. Tony graduated from Oswayo Valley in 1995. Please click on this link to read the article on d9 sports. The softball game scheduled for Friday, April 6, 2018, OV at Northern Potter, has been postponed. This game has been re-scheduled for Monday, May 14th, doubleheader. The baseball and softball games scheduled for today, Thursday, April 5, 2018,OV @ O-E, have been postponed. These games will now be played on Monday, April 23, 2018. The track & field meet scheduled for today, April 5, 2018, OV @ Coudersport, has been postponed. Make-up date is Monday, May 7, 2018. The baseball and softball games scheduled for tonight, Wednesday, April 4, 2018, Port Allegany at OV, have been postponed. These games will be played on Saturday, May 5, 2018 at Noon. Note: The baseball game will be played on this game. The baseball game will start at 2:30pm! All after school activities have been cancelled for this evening, Wednesday, April 4, 2018, due to weather. The baseball and softball games scheduled for today, Tuesday, March 27, 2018, OV @ O-E, have been postponed. These games have been re-scheduled for Thursday, April 5, 2018 at 4:30pm. The baseball scrimmage scheduled for today, Friday, March 23, 2018, has been cancelled. The JH Basketball game scheduled for March 28, 2018, OV at Smethport will start at 4pm. Girls will play first. The Jr. High Basketball game postponed on Friday, March 2, 2018 , Austin @ OV, has been re-scheduled. This game will be played on Tuesday, March 13, 2018. February 16, 2018 will be a make-up day for the snow day on 1/5/18. February 19, 2018 school and offices closed. March 29, 2018 will be a make-up day for the snow day on 2/7/18. The Girls Varsity Basketball game scheduled for tomorrow, February 13, 2018, at Coudersport will now start at 7pm. The boys varsity basketball game postponed on 2/7/18 has been re-scheduled for today, February 8, 2018. Girls varsity will play at 6pm with boys varsity to follow, 7:30pm. The JV boys game will not be re-scheduled. The wrestling match scheduled at Smethport on January 25th will be a varsity only match. The match will start at 6pm. The Jr. High Wrestling Tournament scheduled tomorrow, January 13, 2018 has been postponed. OV will not be attending this event on the re-scheduled date. The boys basketball game scheduled for Saturday, January 13, 2018, has been postponed. This game has been re-scheduled for Saturday, January 20, 2018. The boys basketball game, OV at O-E, scheduled for tonight, January 12, 2018, has been postponed. This game has been re-scheduled for January 29, 2018. The girls varsity basketball game scheduled for tonight, January 12, 2018, Port Allegany at OV, has been postponed. This game has been re-scheduled for February 15, 2018. Oswayo Valley will have an early dismissal today due to weather. All after school activities for tonight have been cancelled or postponed. All activities scheduled for tomorrow, Saturday, January 12, 2018 have been cancelled or postponed. The wrestling match scheduled for February 1, 2018 has been postponed. This match will now take place on February 14, 2018, Johnsonburg at OV. Jr. High starts at 6pm. This match will be held in the MS/HS gym. Classes and all after school activities have been cancelled for Friday, January 5, 2018. The Girls Basketball game, Galeton at OV, scheduled for tomorrow, Friday, January 5, 2018, has been postponed. This game has been re-scheduled for Monday, January 8, 2017, 6pm start. Come out and support the O-E/OV Varsity Football team on Friday, November 3, 2017 as they take on Ridgway in a home D9 Playoff Game. The game will be played at O-E with at 7pm start. Good luck O-E/OV! We are proud of you! Congratulations to Jacob Karr on his 12th place finish last Saturday at the District IX Cross Country Championship race held in Ridgway. Jacob will be heading to Hershey on Saturday, November 4th to compete in the P.I.A.A State Cross Country Championships. Good luck Jacob! OV is proud of you! The OV Spirit Wear Sale is now taking place. The online store will be open through November 19, 2017. Please click on the link below to order your OV Spirit Wear. Good luck to the Oswayo Valley Volleyball Team as they travel to North Clarion High School Thursday, October 26th for a D9 Volleyball Match. The ladies were awarded the number 9 seed. They play the number 8 seed, North Clarion. The match starts at 6:30pm. The OV Trap Team will have a fun day on Saturday, October 28th at the OV Rod & Gun Club. The fun day starts at 2pm. Come try out your shooting abilities and join the OV trap team. Food and refreshments will be available. Come out and support the O-E/O.V. football team on Friday, October 27th. The Terrors play the AML South Champions, Kane Wolves, at Kane. Game starts at 7pm. The winner of this game will be the AML Champion. Good luck O-E/O.V.! CONGRATS to the O-E/O.V. Varsity Football Team! They are back to back AML North Champions! for the 2017 – 2018 school year are now taking place! Please contact Ms. Amy with any questions. Any student in grades 7-12 that will be participating in a sport during the 2017-18 school year must have a physical dated on or after June 1, 2017. In addition, those same students must have an impact test prior to starting practice. The Oswayo Valley School District has contracted with the Cole Memorial Shinglehouse Health Center to provide students the opportunity to obtain a physical at a cost of $16.50 per student. The established dates for these physicals are Tuesday, July 25 and Wednesday, August 2 from 8:30 a.m. until noon. A parent or guardian must be present at the time of the physical. Parents should contact Mrs. Amy Unverdorben to schedule a physical and/or impact test at 814-260-1701 x 225. Payment for the physical is required to be submitted to Mrs. Unverdorben prior to the scheduled appointment. All checks should be made payable to the Oswayo Valley School District. As a reminder, Fall sports begin on Monday, August 14, 2017. Students will not be permitted to participate until the physical and impact testing have been completed. If you have any questions, please contact Mrs. Unverdorben in the Athletic Department. Congratulations to Garret Babcock. Garret was chosen as the Offensive Player of the Year for District 9! Congrats Garret! Congratulations to OV Junior Garren Black! Garren was chosen as the 2017 MVP of District 9 Baseball by D9Sports.com! Congrats Garren! Congratulations to Garren Black, Garret Babcock and Gage Babcock - 2017 Big 30 Baseball All-Star Team! Congratultions to OV's Shayla Bickel - 2017 Big 30 Softball All-Star Team! Congrats Shayla! Mark Olmstead and Dakota Green will travel to Elysburg, PA on Friday, June 9, 2017, to compete in the PSSA State Shoot. Good Luck Mark and Dakota! We are proud of you! OV Fans Ready to Cheer On the OV Baseball Team! The Oswayo Valley Baseball team will travel to DuBois, Showers' Field, tomorrow, June 8, 2017. Game two of the PIAA State Baseball Playoffs. Oswayo Valley vs. Greensburg Central Catholic. The game starts at 4pm. Good luck OV! We are proud of you! 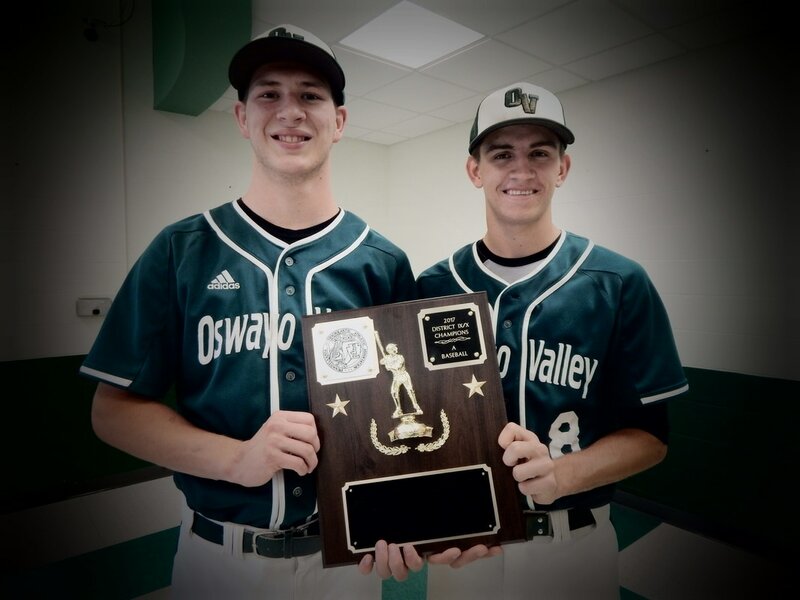 Oswayo Valley Baseball Team Wins 1st State Playoff Game! Congrats to the Oswayo Valley Baseball team on their 8 - 3 victory over Union Tuesday at Showers' Field in DuBois. The PIAA Inter-District Baseball Playoff game scheduled for today, Monday, June 5, 2017, has been postponed until tomorrow, June 6, 2017. Location Change - The game will take place at Showers' Field in DuBois. 4:30pm start time. Good Luck OV! OV will travel to Berwind Park in St. Marys on Monday, June 5, 2017. OV vs. Union. Game starts at 4:30pm. Good luck OV! Congratulations to the OV Baseball Team on their 4-1 win over Clarion on Thursday, June 1, 2017. They are the District IX Baseball Champions! Congrats OV! We are proud of you! OV will travel to Berwind Park in St. Marys on Thursday, June 1, 2017. Oswayo Valley vs. Clarion High School. The game will start at 4:30pm. Good luck OV! We are proud of you! Congratulations to the OV Baseball Team on their victory over Elk County Catholic in the District Semi-Final game held in Bradford. The baseball playoff game scheduled for today, Thursday, May 25, 2017 has been re-scheduled for tomorrow, Friday, May 26, 2017. 4:30pm start. Good Luck OV! OV Sophomore Sara McKean is heading to states! 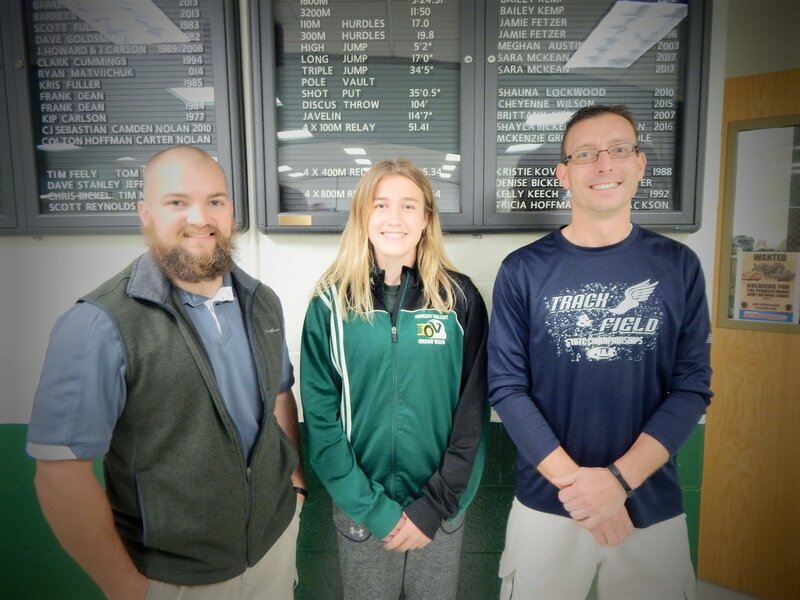 Sara qualified for the state championships by winning the long jump and finishing second in the triple jump at the district championships at Brookville High School. Sara also placed third in the 200 meter dash. She set school records in the triple jump and 200 meter dash with those finishes! Sara will be traveling to Shippensburg University next weekend, May 25th, 26th and 27th with Coach Cummings and Coach Moshier. Congratulations Sara! Good luck at States! We are proud of you! Congratulations to Shayla Bickel for her 5th place finish in the 100 meter dash. Congratulations to Sara McKean, Shayla Bickel, Madison Miller and McKenzie Gross for their 3rd place finish in the 4 x 100 meter relay. Way to represent Oswayo Valley ladies! We are proud of you! The OV Baseball Team will host DuBois Central Catholic on Thursday, May 25, 2017. The game starts at 4:30pm. Come out and support the Green Wave! Good Luck! The OV Baseball team will play Olean Bishop Walsh on Thursday, May 18, 2017 at Forness Park in Olean. The game will start at 4:30pm. The softball game scheduled for tomorrow, May 6, 2017 has been postponed. This game has been re-scheduled for Thursday, May 18, 2017 at 4:30pm, Forness Park in Olean. The baseball game scheduled for tonight, May 1, 2017, has been postponed. This game has been re-scheduled for Tuesday, May 9, 2017. The softball game scheduled for Monday, May 1, 2017 has been postponed. This game will be played on Tuesday, May 9, 2017. Senior Night for softball will also be Tuesday, May 9th. The baseball and softball games scheduled for tonight, April 21st, will be played at Cameron County. Cameron County will play at Oswayo Valley on May 11, 2017. The Softball game scheduled for tonight, Tuesday, April 11, 2017, has been postponed. The team will practice from 4pm - 6pm at Black's. This game has been re-scheduled for Thursday, April 13, 2017, at 2pm. Oswayo Valley Junior Nathan Prouty is shown displaying the plaque he received for being selected to the North Penns Woods Golf League All-Star Team. Nathan was consistently the low scorer for the Oswayo Valley team. He was also selected to advance to the District 9 Tournament held in St. Marys. The baseball game scheduled for Saturday, April 8, 2017, OV @ Cowanesque Valley, will now start at 3pm. The softball game scheduled for tonight, Wednesday, April 5, 2017, has been postponed. This game has been re-scheduled for Tuesday, April 11, 2017. The baseball game scheduled for today, Wednesday, March 29, 2017 will be played at Oswayo Valley instead of Port Allegany. The Softball game, OE @ OV, scheduled for today, Monday, March 27, 2017, has been postponed. This game has been re-scheduled as a double header at OE on Wednesday, April 26, 2017. First game will start at 3:30pm, second game to follow. All After School Activities scheduled for today, Tuesday, March 14, 2017, are cancelled. The Trap Meet scheduled for tomorrow, Tuesday, March 14, 2017 has been postponed. The Trap Meet will now take place on Tuesday, April 11, 2017. Six Oswayo Valley students that were members of the Otto-Eldred football team have been notified that they have been selected to the 2017 WesternPAFootball.net All-Academic Team. Senior Grant West was selected to the Gold Team for having a GPA of 4.0 or higher. Senior Garrett Babcock and Junior Maverick Waterman were selected to the Silver Team for having a GPA between 3.5 and 3.9. Senior Greg Estes, Junior Gage Babcock and Sophomore Michael Vandergrift were selected for having a GPA between 3.0 and 3.49. The selection to a team covering the entire western half of the state of Pennsylvania is a terrific accomplishment for our student athletes. Congratulations to all of these young men. Oswayo Valley Junior Theo Henry and Senior Garret Babcock have been selected to the North Tier League basketball all-star team. These two students join 8 other players from throughout the league as members of the team. Congratulations to both Theo and Garret on very successful seasons. The Jr. High Basketball game scheduled for Friday, March 17, 2017, OV @ Smethport, has been changed to Thursday, March 16, 2017. The Jr. High Basketball game scheduled for Friday, March 3, 2017, OV at Northern Potter, has been postponed. This game has been re-scheduled for Tuesday, March 28, 2017. Good Luck OV! We are proud of you! The Jr. High Basketball game scheduled for Friday, February, 24, 2017 has been changed. The Jr. High game will now take place on Thursday, February 23, 2017, 6pm start. The Jr. High Basketball game scheduled for Wednesday, February 22, 2017, OV @ Galeton, has been postponed. This game has been re-scheduled for Monday, April 3, 2017. 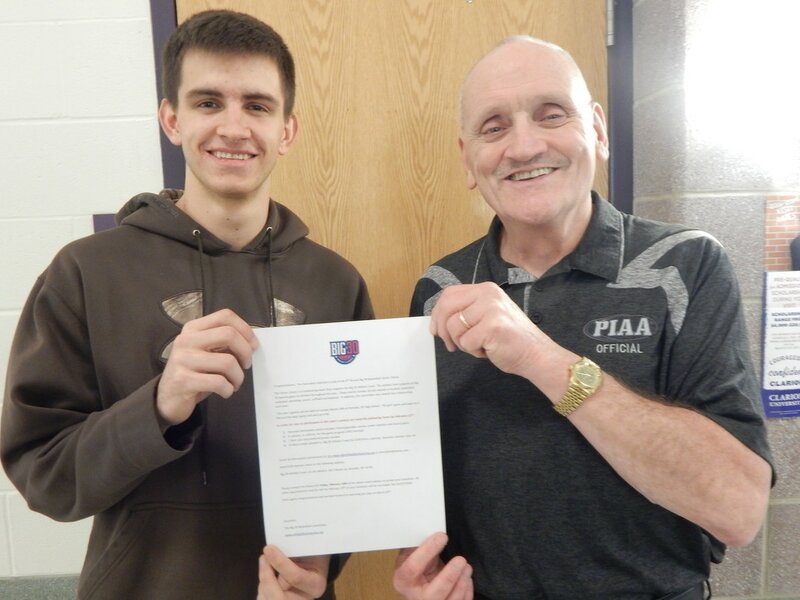 Oswayo Valley Senior Garret Babcock is shown receiving his notification of selection to play in the 3rd Annual Big 30 Basketball Senior Classic from Athletic Director Bill Howard. The game will be played on Sunday March 19 at Portville, NY High School. There will be a girls game starting at 4:00 P.M. and the boys game will start at 6:00 P.M. These games pit graduating seniors from New York State and Pennsylvania similar to the Big 30 Football All-Star Game which is played every year in August. All proceeds from these games go to the Bog 30 Scholarship Fund. Garret is the 4th Oswayo Valley athlete over the years to be selected to play in this prestigious event. The Oswayo Valley community wishes to congratulate Garret on this honor. Spring sports sign ups for the 2016 - 2017 school year are now taking place. Please contact Ms. Amy with any questions. Last day to sign up is Wednesday, February 15, 2017. We look forward to seeing you on a team. The girls basketball game scheduled at Cowanesque Valley on Friday, February 10, 2017 has been cancelled and will not be rescheduled. The Girls JV Basketball game scheduled for Thursday, February 9, 2017 has been cancelled. The Girls Varsity Basketball game will start at 6pm. Senior Night will be held at 6pm. The girls JV/V basketball game postponed on January 23, 2017 , OV @ Cowanesque Valley, has been re-scheduled. The game will be played on Friday, February 10, 2017. The boys JV/V basketball game postponed on January 23, 2017, OV @ Austin, has been re-scheduled. The game will be played on Monday, January 30, 2017. The Wrestling Match that was postponed on January 10, 2017 has been re-scheduled for Tuesday, February 14, 2017, Coudersport @ OV. The Girls JV/V Basketball game that was postponed on January 10, 2017 has been re-scheduled. Oswayo Valley will travel to Port Allegany on Wednesday, February 15, 2017. The boys basketball game scheduled for Wednesday, January 18, 2017 has a time change. The JV game will start at 5:30pm and the Varsity game will start at 7pm. The Oswayo Valley School District will have an early dismissal today, Tuesday, January 10, 2017. The MS/HS students will be dismissed at 12:15pm and the Elementary students at 12:20pm. All after school and evening activities have been cancelled for tonight. Oswayo Valley Senior Tiffany Dickerson is shown signing a National Letter of Intent to play volleyball at Finger Lakes Community College in Canandaigua, NY where she plans to major in Liberal Arts. The JV Basketball game scheduled for tonight January 4, 2017, OV @ Smethport, has been cancelled. The Varsity Girls Basketball game will now start at 6pm. The wrestling tournament scheduled for tomorrow, Saturday, December 17, 2016, has been cancelled. The Wrestling match, Sheffield at OV, scheduled for tonight, Thursday, December 15, 2016, has been postponed. This match has been re-scheduled for Thursday, January 5, 2017. The girls basketball game, OV @ Austin, scheduled for Tuesday, December 20, 2016 has been changed. The game will now be held on Monday, December 19, 2016. 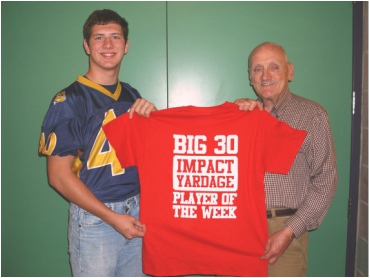 Gage Babcock was selected as Pennsylvania Impact Yardage Player of the week ending October 15, 2016 by Wayne paving. In addition to the t-shirt that Gage received, a donation in the amount of $100 to support the Don Raabe Big 30 Charity was made in Gage's name. Grant West was selected as Pennsylvania Impact Yardage Player of the week ending October 8, 2016 by Wayne Paving. In addition to the t-shirt that Grant received, a contribution in the amount of $100 to support the Don Raabe Big 30 Charity was donated in Grant's name. The Jr. High Volleyball game scheduled for Thursday, October 27, 2016 at OE has been postponed. The Jr. High Volleyball game will now take place on Wednesday, November 2, 2016. The Jr. High Football game scheduled for Thursday, October 27, 2016 at OE, has been postponed. Location and time of game has also changed. The Jr. High Football game will now take place on Wednesday, October 26, 2016 at ECC with a 4pm start. Come out and support the Varsity Football Team! If you are not able to make the game, tune in to 97.5 The Hound for play by play action. Congratulations to the Varsity Football Team on their win over Smethport Friday night, 39-0 (10/21/16). They are the AML North Champions! Video Highlight from the OE vs. Smethport game, courtesy of D9 Sports, starts at 1:40. The softball game scheduled for tonight, Friday, May 13, 2016, has been postponed. The game will now take place on Tuesday, May 17, 2016. Start time of 4pm. Senior Night for softball will now take place on Thursday, May 12, 2016. The softball game scheduled for tomorrow, Saturday, May 7, 2016 has been postponed. The softball game will now take place on Friday, May 13, 2016. The softball game scheduled for tonight, Monday, May 2, 2016, has been postponed. This game will now take place tomorrow, Tuesday, May 3, 2016. The baseball game scheduled for tonight, Monday, May 2, 2016, will now take place at Oswayo Valley. Sports sign ups for the 2016 - 2017 school year are now taking place. Last day to sign up is Friday, May 6, 2016. Please refer to the information sheet sent home with your child or contact Ms. Amy at 814-260-1701 ext. 225 with any questions. The baseball and softball games scheduled for Saturday, May 7, 2016 will have a start time of 3:30pm. The baseball game scheduled for Monday, May 2, 2016 will be played at Smethport. The location of the baseball game scheduled for today, Wednesday, April 13, 2016, has been changed. The baseball game will take place at Oswayo Valley. The baseball and softball games scheduled for today, Monday, April 11, 2016, Galeton @ OV, have been postponed. Both games will be played on Thursday, April 14, 2016, 4:30pm start. The baseball and softball games scheduled for tomorrow, Saturday, April 9, 2016, have been postponed. These games have been re-scheduled for Monday, May 9, 2016. Please note, 5pm start. The softball game scheduled for today, April 8, 2016, Smethport @ OV, has been postponed. This game will now take place on Monday, April 18, 2016, 4:30pm start. The baseball and softball games scheduled for tonight, Monday, April 4, 2016, Bradford @ OV, have been postponed. The baseball game will now take place on Tuesday, April 12, 2016 at 4:30pm. The softball game will now take place on Saturday, April 23, 2016 at 11am. The baseball and softball games scheduled for tomorrow, Saturday, April 2, 2016, Cowanesque Valley @ OV, have been postponed. Make-up date TBA. The baseball game has been re-scheduled for Tuesday, May 3, 2016, 4:30pm start. The softball game has been re-scheduled for Monday, May 2, 2016, 4:30pm start. The Oswayo Valley Wrestling Team traveled to Clearfield this past weekend for District Wrestling. Grant West placed 3rd. Dylan Pesock placed 4th. Both Grant and Dylan qualified for Regional Wrestling. They will travel to Sharon, PA on Friday, March 4th. Congrats Grant and Dylan! Good luck! The Jr. High Basketball game scheduled for Friday, February 19, 2016, OV @ Smethport, will be played at Smethport's Elementary Gym. The Jr. High Basketball game schedule for tonight, Wednesday, February 17, 2016, Galeton @ OV, has been postponed. The game has been re-scheduled for Thursday, March 31, 2016, Galeton @ OV, 6pm start. The Jr. High Basketball game scheduled for Tuesday, February 16, 2016, OV @ Austin, has been postponed. The game has been re-scheduled for Tuesday, March 1, 2016, OV @ Austin. The Oswayo Valley Boys Varsity Basketball Team has qualified for D9 playoffs. Home game schedule for Wednesday, February 17, 2016, Oswayo Valley vs. Cameron County. Game starts at 7pm. Admission $5 Adult and $2 Student - D9 Passes Only. Three Seniors from Oswayo Valley have been selected to participate in the 2nd annual Big 30 Basketball Senior Classic. The games will be held in Portville, New York on March 13. The girls game will start at 4:00 P.M. and the boys game will start at 6:00 P.M. The games will feature outstanding Seniors from New York and Pennsylvania competing against each other to raise money for the Big 30 Charities Athletic Fund. This is a great honor for our students and they are to be commended for stellar basketball careers. Oswayo Valley Senior Dylan Buchholz is shown signing his National Letter of Intent to play baseball at Erie Community College in Buffalo, NY. Dylan was named the Northern Allegheny Baseball League co-player of the year in 2015 and was also named to the Olean Times-Herald Big 30 All-Star Team. He plans to major in Business Administration in college. The JV Boys Basketball game scheduled for tonight, OV @ Port Allegany has been cancelled. The Varsity Boys game will still be played and start at 7pm. The bus will depart OV at 5:45pm. 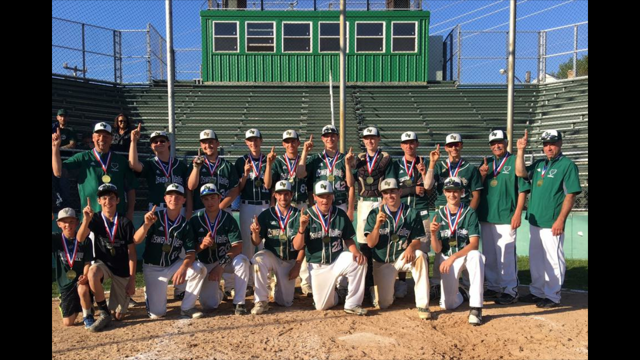 The Oswayo Valley Baseball Team defeated Clarion HS last night (5/29) in the D9 Championship game. This is the first team in OV history to win the D9 Championship Game! Congrats OV, we are proud of you! Oswayo Valley now heads to States. They will play California HS on Monday, June 1, 2015 in DuBois at Showers' Field, Round 1 of the PIAA Playoffs. The game starts at 5pm. OV won their semifinal game last night (5/26) vs. DuBois Central Catholic. They head back to Berwind Park in St. Marys on Thursday (5/28) for the D9 Championship game, OV vs. Clarion HS. The game starts at 4:30pm. Good Luck OV! We are proud of you! The Green Wave defeated Redbank Valley 11-1 on Thursday. OV travels to Berwind Park in St. Marys next Tuesday, May 26th where they will play DuBois Central Catholic, 4:30pm start. Good Luck OV!! We are proud of you! The OV Baseball Team will host Redbank Valley on Thursday, May 21, 2015. The game starts at 4:30pm. Come out and support the Green Wave! Good Luck! OV Baseball Team - Northern Allegheny League Champs! The OV Baseball Team finished the season with a record of 17-2. Undefeated in league play, they are the Northern Allegheny League Champs! Congratulations - We are proud of you!!! Sports sign ups for the 2015 - 2016 school year are now taking place. Please sign up by Friday, May 8, 2015 at 3pm. Please contact Ms. Amy with any questions. The softball scheduled for Saturday, April 25, 2015 will start at 12pm instead of 11am. The baseball game scheduled for Saturday, April 25, 2015, has been postponed. This game will now be played on Tuesday, May 5, 2015. The baseball and softball games scheduled for Wednesday, May 6, 2015, OV @ Port Allegany, have been changed to Thursday, May 7, 2015. The softball game scheduled for tonight, Thursday, April 23, 2015, has been postponed. This game will now take place on Tuesday, May 5, 2015 at Galeton. This will be a double header. The softball game scheduled for today, N﻿﻿orthern Potter @ OV, has been postponed. This game will now take place on Friday, May 15, 2015. This game will be a double header starting as close to 4pm as possible. This game will be played at Northern Potter. The baseball game that was suspended last night, Monday, April 20, 2015, due to weather, will be completed at Coudersport on Monday, May 4, 2015 before the game already scheduled for that day. The softball game scheduled for today, Monday, April 20, 2015, Coudersport @ OV, will now take place in Coudersport. The baseball game scheduled for Friday, April 17, 2015, OV @ OE, will now be played on Thursday, April 16, 2015. The baseball game scheduled for Friday, April 10, 2015, OV @ Smethport, which was then switched to OV, has now been postponed. This game will now be played on Monday, April 27, 2015, OV @ Smethport. The softball game scheduled for Friday, April 10, 2015, OV @ Smethport, has been postponed. This game will now be played on May 9, 2015 with a 10am start. The softball game scheduled for Wednesday, April 8, 2015, OV @ Galeton has been postponed. This game has been re-scheduled for Tuesday, May 5, 2015. The baseball and softball games scheduled for tonight, Tuesday, April 7, 2015, OV @ Cameron County (this was originally Cameron County @ OV) has been postponed. The baseball game will now be played at OV on Saturday, April 11, 2015. This will be a double header. **Updated** This baseball game will now be played AT Cameron County. The softball game will now be played at Cameron County on Saturday, April 11, 2015. This will be a double header. The track and field meet scheduled for tomorrow, Thursday, April 2, 2015 has been postponed. This meet will now take place on Thursday, April 9, 2015. ﻿The softball game scheduled for Wednesday, April 1, 2015, Austin @ OV, has been postponed. This game will now take place on Monday, May 11, 2015 at Austin. This will be a double header. The baseball and softball games scheduled for tonight, Monday, March 30, 2015, OV @ Cowanesque Valley, have been postponed. These games have been re-scheduled for Tuesday, May 12, 2015. The Softball game scheduled for Friday, March 27, 2015, OV @ Bradford, has been postponed. This game will now take place on Saturday, April 25, 2015 at 11am. The Baseball and Softball games scheduled for Wednesday, March 25, 2015, OV @ Cameron County, have been postponed. These games have been re-scheduled for Saturday, April 11, 2015, 11am start time. Both games will be double headers. The Baseball and Softball games scheduled for Monday, March 23, 2015, OV @ Northern Potter, have been postponed. The baseball and softball games will now take place on Saturday, April 4, 2015 at 11am. ****Update 3/30/15**** The baseball and softball games have been postponed again. These games will now take place at OV on Tuesday, April 21, 2015 - double header (DH). The Oswayo Valley School District will have an early dismissal today, 1pm MS/HS students and 1:05pm Elem students. All after school activities have been cancelled. The Oswayo Valley School District will be operating on a two hour delay tomorrow, Tuesday, February 24, 2015. The Jr. High Basketball game scheduled for Saturday, February 21, 2015, OV @ Cameron County, has been postponed. Make-up date TBA. The Oswayo Valley School District will be operating on a two hour delay tomorrow, Friday, February 20, 2015. The Oswayo Valley School District will be operating on a two hour delay tomorrow, Thursday, February 19, 2015. The Oswayo Valley School District will be operating on a two hour delay tomorrow, Friday, February 13, 2015. The Boys JV/V Basketball game and Senior Night scheduled for tonight, Monday, February 9, 2015, is tentatively re-scheduled for tomorrow, Tuesday, February 10, 2015. Classes and All After School Activities are Cancelled Today, Monday, February 9, 2015. Oswayo Valley has a two hour delay today, Tuesday, January 27, 2015. The boys JV/V basketball game scheduled for tonight, January 26, 2015, OV @ Austin, has been postponed. This game will take place on Tuesday, January 27, 2015. All after school activities have been cancelled today, Monday, January 26, 2015. Hey OV Fans, Got Pride? Show It! Get Your Spirit Wear at www.oswayovalley.com. Order forms are also available at the school. OV Spirit Wear, Get Yours Today! Last Day to Order is Thursday, February 12th! Oswayo Valley will be operating on a two hour delay tomorrow, Thursday, January 8, 2015. Classes and all after school activities have been cancelled for today, Thursday, December 11, 2014. The Wrestling match scheduled for tonight, Thursday, December 11, 2014 Sheffield @ OV, has been postponed. Make-up date TBA. Congrats Brandon Brabham on your 11th place finish at Districts. Brandon will be heading to Hershey to compete in the Cross Country State Championships! Good Luck Brandon! District IX Volleyball Playoff Game at OV on Tuesday, October 28, 2014 at 6:3opm vs. Curwensville! Good Luck to the Lady Green Waves! Congratulations to the Oswayo Valley Golf Team - League Champions!! Winter Sports Sign-Ups are taking place October 1 - October 17, 2014. This is for Girls' and Boys' Basketball and Wrestling. Please see Ms. Amy with any questions. Contact Ms. Grace in the High School Office to schedule an appointment. Fall Sports start Monday, August 11, 2014!